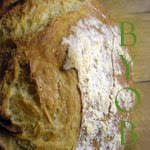 Thanks goes out to sandy At the Baker's Bench for coming up with the idea for BYOB ( bake your own bread). I recently got a copy of "Artisan Bread in five minutes a day" and made my first batch of dough for the refrigerator. There is no kneading involved yet the results are a light, airy, chewy loaf of bread. It goes against everything I know not to knead this dough! So with out further delay here is my first attempt using this new technique.